The Supreme Court today dismissed a petition filed against Bollywood Superstar Aamir Khan and his production house for allegedly using the national emblem in an improper manner in his TV show ‘Satyamev Jayate’ and making “commercial gains” out of it. 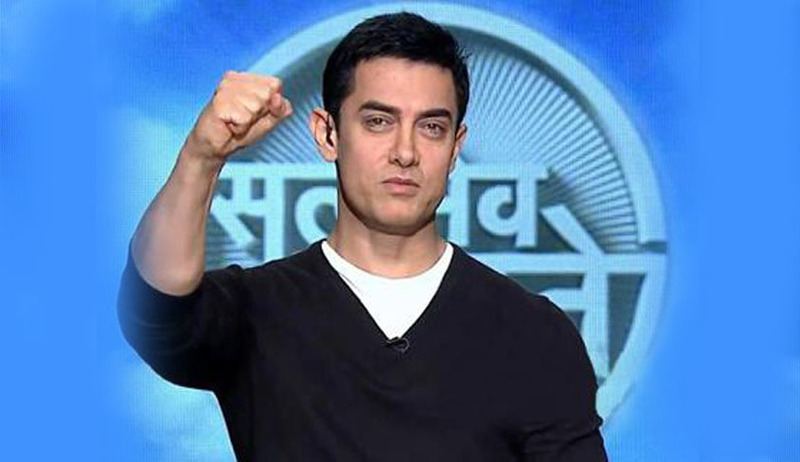 Satyamev Jayate, a popular show on social issues hosted by Aamir Khan, aired on Star TV between May 2012-and July 2014. The matter-ARRIVE SAFE SOCIETY OF CHANDIGARH VS. AAMIR KHAN PRODUCTIONS & ORS was listed as item no. 12 before the bench headed by Chief Justice T S Thakur. The petition was filed by Chandigarh-based NGO Arrive Safe through its president Harman Sidhu. A person with physical disability, he had argued the case in person sitting on a wheelchair. Sidhu had approached against an order of the Punjab and Haryana High Court dated November 3, 2015 wherein it had observed that the petitioner could file a criminal case against Aamir Khan before the appropriate forum. “The order says appropriate forum. Why did you come here ?. No we do not see any merit in it “, CJI Thakur told Sidhu. He had sought directions to register an FIR against Aamir Khan and other people related to his production house for improper use of the national emblem in his TV serial. Alleging that Khan and others related to his production house had misused the national emblem for private commercial gain, Sidhu claimed that they had committed offences punishable under Emblems and Names (Prevention of Improper Use) Act 1950 and The State Emblem of India (Prohibition of Improper Use) Act 2005. It is to be noted that on June 21, 2016 Bombay High Court had dismissed a public interest litigation (PIL) filed by one Manoranjan Roy which had asked for action against the makers of TV show Satyamev Jayate for using a part of the emblem. The union government however said in an affidavit that the title uses only a part of the emblem and that it does not amount to any offence. Referring to the 1950 act, Additional Solicitor General Anil Singh explained to Justice Abhay Oka that the "usage of Ashok Chakra or Dharm Chakra is specifically prohibited in the act, while the usage of words 'Satyamev Jayate' is not specifically prohibited," arguing that the elephant, lion, galloping horse and Dharma Chakra everything together form the emblem. Star TV and Amir Khan had also pressed for the dismissal of the petition in their affidavits. The petitioner however contended that the show makers had used part of the emblem which is the two words-- "Satyamev Jayate". The petitioner also claimed that even the usage of Satyamev Jayate by state could not be allowed without the permission from union government as it was part of the emblem. Justice Oka noted, "It is not imitation of the Ashok Chakra at all. The respondents had not used the official seal, name or emblem of the Government of India," and with this he dismissed the petition.